The power of Carl Carter’s art cannot be overstated. It is his art that, years ago, took him from facing eviction after suffering a serious back injury as a steelworker to putting food on his family’s table and a roof over their heads. That brought his work to the homes of art collectors across the nation. That, eventually, made him realize: I’ve made it. That, in an art world filled with barrier after barrier, he was able to rise to the top, to a place where he’s known around the country, where he’s now kicking off a national art tour with a show in Muskegon Heights. After his back injury, Carter faced surgery and nine months of rehabilitation. But even after intensive physical therapy, he wasn’t going to be able to return to his job as a steelworker. From that point on, Carter forged ahead, the fuel for his art coming from a desire to make sure his family would be alright. These words are emblematic of Carter’s entire demeanor: he is exceedingly humble, but his story is one of great success. It is not a story without pain, but it is one of passion and love—for his family, for his art and for the world around him. It is a story about a man who taught himself the ins and outs of the art world, who spent months at Barnes and Noble to read all the art books he could possibly get his hands on. It is a story of talent and nonstop hard work and sticking to a dream, no matter how many people told him he wouldn’t succeed. Throughout his career, Carter has exhibited at shows across the U.S., including in Detroit and Chicago, and, now, his event in Muskegon Heights kicks off a national art tour that will bring him to such cities as Atlanta and Seattle. Hosted by Muskegon Heights Mayor Kim Sims, Saturday’s event will feature the 30-plus original works by Carter, as well as spoken word performances by local artists Frederick Waller and D’Erika Nichols and catering by Damon Covington, the owner of G55 Catering and the executive chef at Fuel Bar in Spring Lake. Saturday will, of course, be a celebration of Carter and his work, but, for the artist and for the community, it is even more than that. It is symbolic of the lifetime it has taken to get here: the paintings slated to be exhibited at the show are glimpses of one man’s imagination, of his creativity, of his struggles and joy and never-ending work. Saturday too will be emblematic of his city: Muskegon Heights. Of the people who poured their belief and support into Carter, like J Arthur Sanders, who for years taught art at Muskegon Heights schools. In many ways, this show is a “passing of the torch” from Sanders to Carter, Waller said. One of Sanders’ students was Carter, and the artist said he would not be where he is today without his teacher. 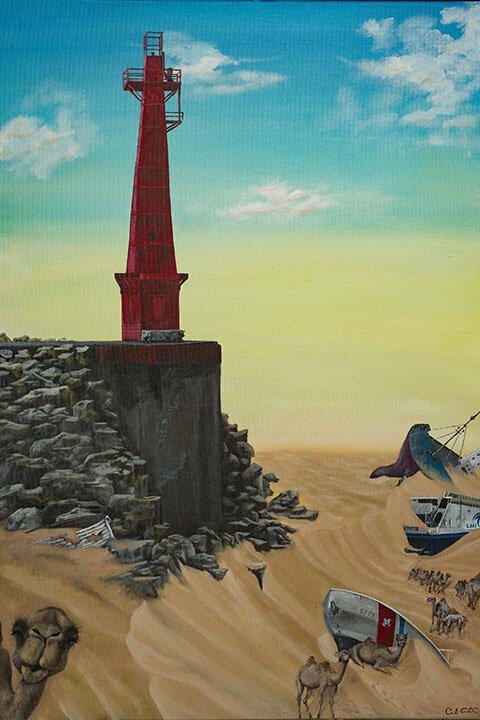 Those countless hours Carter has spent before canvasses has translated to a thought-provoking, evocative body of work: paintings that depict the Muskegon Heights High School under water and a Pere Marquette lighthouse surrounded by a dry Lake Michigan, shipwrecked boats lying on their sides in the sand that has overtaken the water. 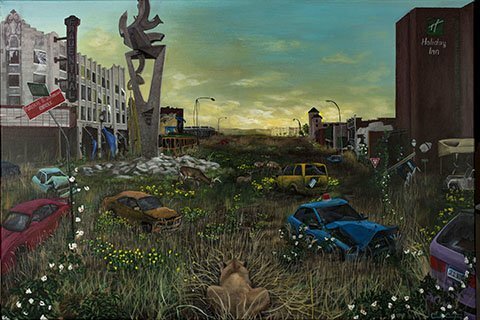 Another painting depicts an overgrown downtown Muskegon, grasses and abandoned cars taking up space where people once were. “I paint out of my head; when people ask about my work, I say, ‘Welcome to my imagination,’” Carter said. 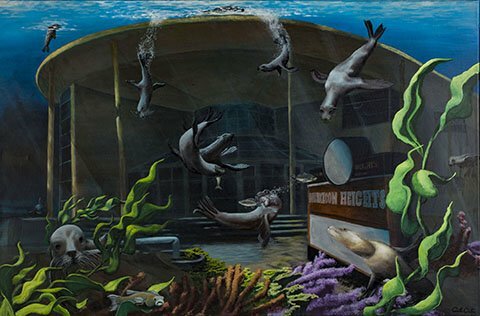 As for the meaning of his work, Carter said it aims to provoke thought and dialogue, including two paintings that depict Muskegon Heights under water. 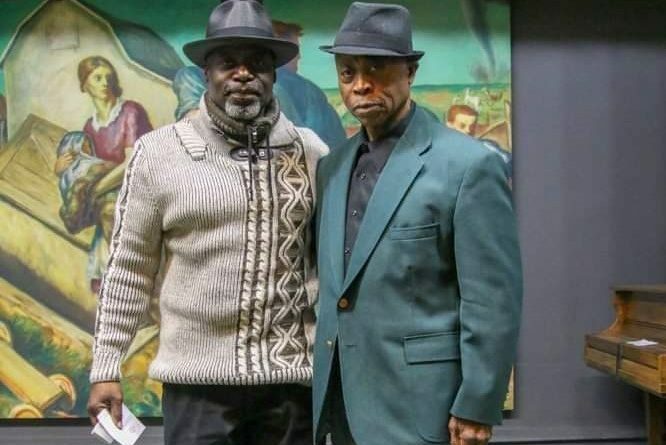 For Waller, a longtime arts and civic leader in Muskegon Heights who has served as an area football coach, poet, barber, and more, the painting of the submerged Muskegon Heights High School was particularly powerful. As for its meaning, Waller said the work is representative of the turmoil happening with the Muskegon Heights High School. It is that message of survival that ties together so much of Carter’s work—and life. Carter, and Muskegon Heights, have survived—despite people telling them they wouldn’t. They’ve risen and fallen and risen again; they’ve ignored those who have said they’re done for and they’ve succeeded. So much of Carter’s story is seen in Muskegon Heights’ own narrative: the strength of community, the focus on the arts, the disenfranchisement, the struggle and the laughter and the tears. In a world that will so often be willing to merely view people’s hardships, as opposed to really understanding why those struggles exist, Carter’s work makes people think. Its power lies within both its beauty and its sadness, in its ability to make people look, really look, at the lies we tell ourselves, at the lives we live, at the power of community—and what we have to do to ensure those communities not only continue, but thrive. 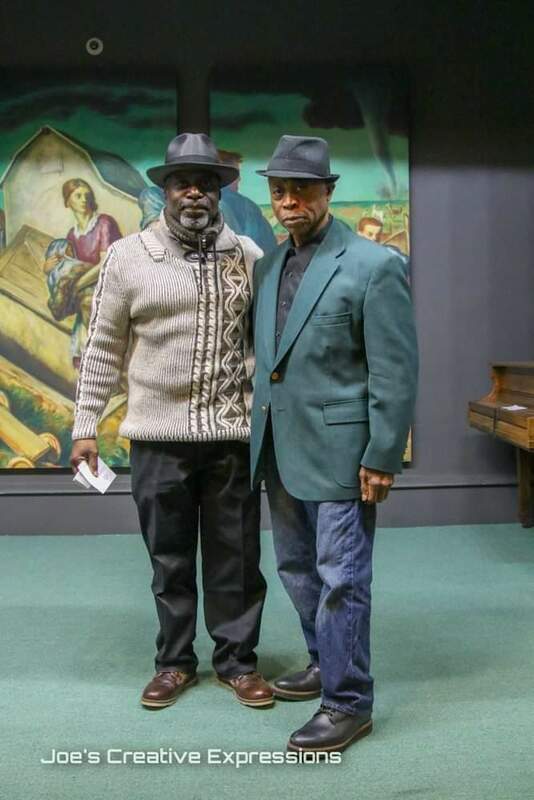 Both Carter and Waller are hoping to grow the arts landscape in Muskegon Heights, with Carter aiming to open a community arts center and Waller setting his sights on owning a restaurant with a vibrant live performing arts scene. “The Heights area is rich with art, but there’s nowhere for these people to go and network,” Carter said. “I think in the Heights area alone there should be a big art club for visual artists and for the arts period,” he continued. 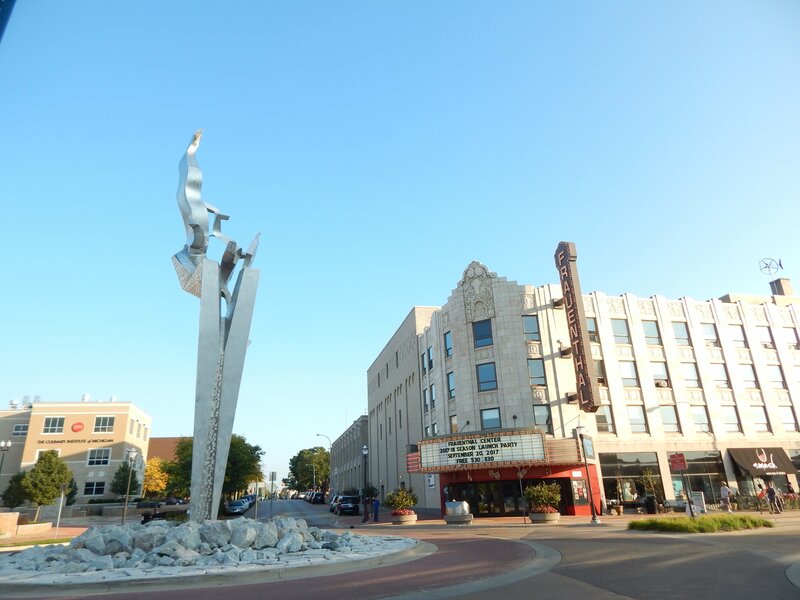 Carter dreams of opening a center for artists in Muskegon Heights that would offer an affordable, or even free, space for people to congregate and share their work. Waller too noted the strong and growing arts scene in Muskegon Heights and said he’d love to showcase the talent here by opening a restaurant that offered live performing arts. “To be able to see people eat, satisfy the soul and be entertained, that’s the ultimate to me,” he said. The Carl Carter art show will take place this Saturday, March 30 from 6-9pm at Mahali, 2780 Peck St. in Muskegon Heights. The event is free and open to the public. To learn more about Carl Carter, you can visit his website by clicking here. Love the article and the artworks featured. I am looking forward to the event. Great article! Wishing you great success with your show!